Using the lens of a film camera to capture history has always been an interesting exercise to me. For one, the trade craft have an opportunity to look at fashion and make up; the prop department gets to find classic cars of the era while set designers find just the right artwork to hang on the wall. Filming the 1970s in 2017 has its own set of logistical challenges as well, as Ridley Scott learned during the filming of his latest crime thriller, All the Money in the World. Why is any of the above germane to your enjoyment of this film? David Scarpa’s story, set in the mid-1970s, is as much about the look of the times the film is set as much as it is about the story and the man behind an empire. Mr. Scott, for his many gifts, is a perfectionist and there’s no better director out there today to have captured this era or its main subjects, let alone to have captured it twice. The film centers on the kidnapping of John Paul Getty III (Charlie Plummer) by an organized crime syndicate. A ransom demand is issued for his release, however Gail Getty (Williams) doesn’t have the money to pay the ransom and she fears the worst. As a result, she turns to J. Paul Getty (Christopher Plummer) for help, for which he refuses to pay the ransom. Instead, he turns to his business affairs manager, Fletcher Chase (Mark Wahlberg) to investigate and assist Ms. Getty through the ordeal. The cast is first rate. Ms. Williams’ performance reminded me of Ellen Burstyn’s performance in The Exorcist: regal, stylish and fashionable, yet very much weary from the family events of the time. Mark Wahlberg has played this role previously, but his performance is fresh. He reminded me of Alain Delon in Scorpio: cool, collected and when called upon, unassuming. Charlie Plummer as young J. Paul Getty could be reminiscent of any young jettsetting actor/musician of the mid-1970’s, but Shaun Cassidy comes to mind: footloose and fancy-free while also being very worldly, having lived in Italy and Morocco as a teenager, yet like his mom, he was guarded. The film suggests that his worldliness made it easier to kidnap him, while his guard prolonged his captivity: he was ingenious when given the chance. Romain Duris, who I wasn’t familiar with before this film, plays Cinquanta, one of young Getty’s captors. There is a duality between Gail and Fletcher which runs over the course of the film, a symbiotic need even if neither immediately recognizes it. The same duality runs between John Paul and Cinquanta. Both of these relationships are a strong foundation to a remarkable story. At the center of it all is the man with the tight purse strings, J. Paul Getty. Christopher Plummer, who has been recognized with a Golden Globe nomination for his performance, is absolutely magnetic as the old, miser. As the world’s richest oil magnate, ‘deal’ and ‘discount’ were his operative phrases; ‘family’ was most definitely not one of his top priorities. As much as it was a logistical nightmare to recreate 1970s Europe, so was the casting of the pivotal role of J. Paul Getty. Reports surfaced during casting that Christopher Plummer was Mr. Scott’s first choice for the role, but he was unavailable. The role was awarded to Kevin Spacey, whose scenes appeared in early trailers and advertising. The film was also set to close the AFI Fest this year, but when a scandal rocked Hollywood and directly implicated Mr. Spacey, the studio decided to pull the film from the AFI Fest and Mr. Scott recasted the role with his original choice, reshooting Mr. Getty’s scenes in just nine days, keeping the film’s release more or less on track. 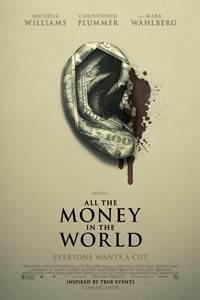 As with any film Ridley Scott touches, there are many layers and nuances and All the Money in the World is no exception. Each character represents a pawn in Mr. Getty’s grand chess game. Some move willingly, others not so. But, there is an end game in mind, and the reveal at the end of the film is so subtly done that you almost don’t see it coming. And, that’s the hallmark of a Ridley Scott film. Now in theaters, Ridley Scott’s All the Money in the World captures the essence of what the Getty’s represent to society at large, past and present, while offering a wonderful, modern 1970’s-esque escapist film like The French Connection. Mr. Scott effectively channels his inner Billy Friedkin and John Frankenheimer while exploring the dynamic of a dynasty.